There are many different styles and version for BBQ Chicken Wings. Some use garlic, while others add honey. You can marinade them, then pack into ziploc to freeze. When you need it, just defrost and chuck into oven or grill it over. Drain and pat dry chicken wings with paper towels before marinating. In a large bowl, combine marinate ingredients together, and massage well with chicken wings. Leave wings to marinate for at least half an hour or preferably refrigerate overnight in a ziploc bag. Remove chicken wings from refrigerator few hours ahead before grilling. If using BBQ grill, oil the grill grate before starting the grill. If using oven, adjust temperature to 430 F.
If you prefer metal skewers, carefully pierce through the chicken wings. For wooden skewers, soak them in water for 1 hour beforehand. You will need about 1/2 cup of honey in a separate bowl for brushing later. For BBQ grill, grill till chicken wings are golden brown, turning wings occasionally. Brush liberally on both sides of wings with honey and continue cooking for 10 minutes. Cover the BBQ grill and turn off the heat. Let the wings sit in the grill for 10 minutes. 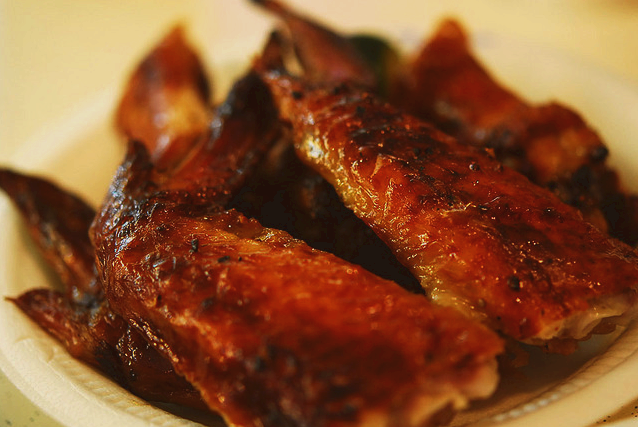 If grilling in oven, grill till chicken wing skin is crisp and meat is tender. Turn off the heat, and let the wings sit in the oven for 10 minutes. To enjoy the wings, squeeze lime juice all over wings and dip them in spicy chilli sauce.